No. 1, Jalan BP 6/11, Bandar Bukit Puchong, 47120 Puchong, Selangor, Malaysia. TOPSAFE® being a reputable safety footwear manufacturer, is fully confident and spares no effort to guarantee the quality of its product. You will be delighted to know that such commitment is now backed-up by a RM 2,000,000,00 product liability insurance policy undertaken by a reputable insurer. With this exclusive benefit, you can feel more secured and confident in wearing TOPSAFE® safety footwear during your time at work. The product liability policy containing the full Terms, exceptions may be viewed at TOPSAFE® office on request. 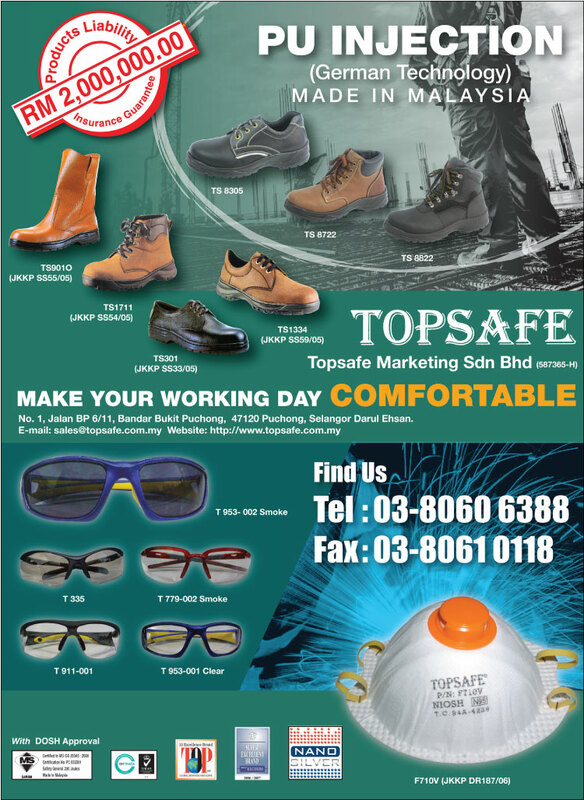 Established in 1995, TOPSAFE® is today one of Malaysia's leading manufacturers and distributors of well-designed and quality safety footwear. Its products are made to international stringent quality controls and standards that include the Malaysia MS1599 : 1998 (MS EN345:1998) and ISO 9001 : 2000 Certification. TOPSAFE® also awarded the "Asia Pacific Super Excellent Brand 2006/2007" and "2006 Top 20 Excellent Brand". Its RM2 million product liability insurance policy underwritten by a reputable insurer demonstrates TOPSAFE®'s commitment to product excellence and to manufacture quality safety footwear for both men and women to make their working day comfortable. TOPSAFE® safety footwear are made to such safety specifications as having genuine upper leather, extra grip, soles resistant to common acids and alkalis, are chemically inert to common oils and having reinforced stitching for excellent bonding. Other requirements can be met on request.